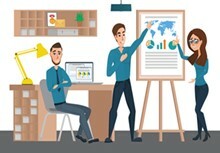 Many organizations, including not - for - profits, businesses, civic and government groups, realize the need to include meetings, as part of their overall programing, etc. While some do so professionally, and effectively, many others seem to use a far less effective approach, and often net far lesser results than desired. An organization must delegate much of the responsibility for getting this achieved successfully to an individual, or individuals, with the knowledge, experience, capabilities, assets, skills and attitude, to be a true leader, in this component! In order to do so, this article will examine 10 keys, in terms of how today's meeting planners, must focus, and proceed. 1. Think on your feet: Select someone who is capable of expanding his comfort zone, and considering alternatives, and genuine knowledge and wisdom. One must be proactive, and willing to make adjustments, on the fly, viewing obstacles as challenges to overcome, rather than problems! 2. Greener meetings: At one time, few individuals thought much about the environmental impacts of things, while today, nearly every supermarket devotes aisles to natural and green products. Emphasize the green aspects of your meeting to potential attendees, as a selling point! 3. Get feedback from others: While many use post - event surveys, etc, one rarely is certain of the quality of the feedback. How can you know the value, if you don't know if the individual has the background or knowledge, to accurately evaluate it? Make a point of speaking to event regulars, as well as former attendees. Include a thorough discussion with vendors, also, so you can take advantage of their knowledge, expertise and perspective. 4. Escape from your comfort zone: Don't get stuck in the rut, of merely doing the same - old, same - old. Use those time - tested, positive approaches and nuances, but seek to always get better, and more relevant. 5. Use trustworthy vendors and venues: No matter how well you might plan and/ or negotiate, you will still be, at least partially, dependent upon your vendors and venues, to live up to their promises, and part of the bargain. Investigate those you will do business with, by speaking to their former customers, etc. Your vendors and venues will either help you shine, or sink your ship! 6. Be organized and clear: How will you assure your check - in/ registration process runs smoothly? You must have a list and responsibilities assigned, and prepared, for each component! When you delegate, be sure, each individual fully understands, and is prepared, to assume his responsibilities! 7. Get attendees to help you market: Ask your attendees to take pictures and share them, to Social Media. Assign a specific hash tag, to the event. Encourage this activity by offering some sort of prize, award, or recognition. 8. Know your group, and site: What is unique about your organization, and what do potential attendees, expect, desire and prioritize? Will they consider the event worthwhile, because they perceive value? How will you assure they do? What are the strengths and weaknesses of the specific venue, and how can you best utilize the strong - points, while minimizing the weaker ones? Be proactive! 9. Use creative solutions: Think outside the box! What can you do, to reduce expenses, while not affecting quality and/ or perceptions? How can you be better prepared? What might you do, to reduce the cost of supplies, etc? Might any of the vendors, also be willing to sponsor other aspects of the event? 10. Use metrics to measure your effectiveness: How will you determine how you've done, so you might address areas of weakness, and improve in the future? Remember, metrics are only as valuable, as the quality (or lack of) of the data/ information collected! Professional meeting planners (and/ or event planners) use a time - tested, step - by - step approach, to make sure they've touched all the bases, and enhance their chance to deliver a quality result! Use these 10 steps to get closer to consistently producing better events, and results!